The Organ is a 57 stop, approximately 40 rank instrument comprising pipework of the builders Miller and Able, Hillgreen Lane, and Peragallo. The Peragallo company rebuilt the instrument in 1994, reusing pipework from the previous two installations, some of which dates from before 1900. You can view the stoplist here. 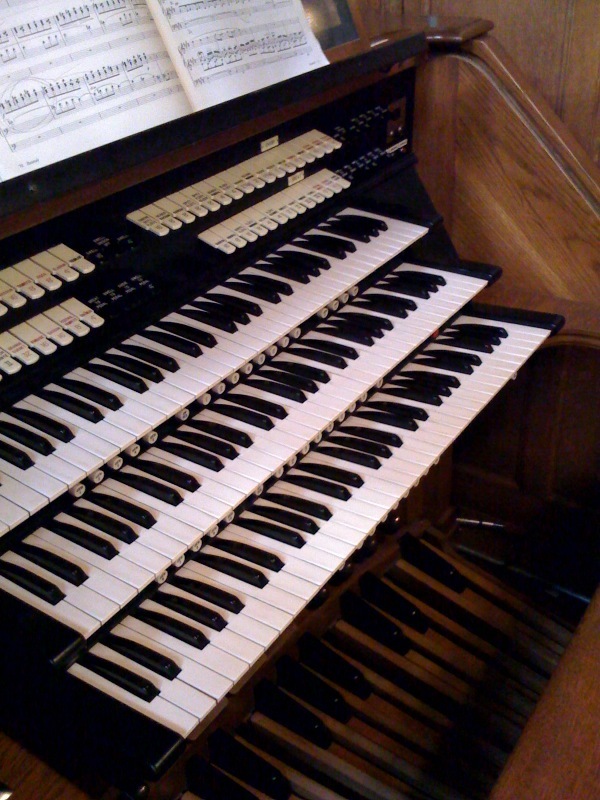 In its present configuration, it is a three-manual and pedal instrument housed in a 1960’s era Austin console. The pipework is housed behind a non-playing façade in the sanctuary, speaking directly to the choir stalls, with the console placed underneath the pipework. It is tonally most at home playing the French Symphonic repertoire, but handles a wide variety of styles well, and due to its two expressive divisions, is an excellent instrument for choral accompaniment. The organ is heard at the 10:00 Mass every Sunday, Holy Days, and Wednesdays during Lent, and is used frequently in recitals as part of Music at St. James. The current instrument was tonally redesigned and expanded in the American Classical tradition by the Peragallo Pipe Organ Co. of Paterson, NJ during the mid-1990s. Some of the pipework dates back to the original instrument of over a century ago, with enclosed swell and choir divisions. All of the pipework is located in the east wall of the chancel behind two facades, with the console partially hidden from view below.